As brunettes in their 20s and 30s reach for the peroxide bottle, or at least switch to a short bob, The Fall delivered it’s fourth and penultimate gripping instalment. DCI Eastwood’s investigation into the murder of their colleague James Olson (DSI Stella Gibson’s one-night stand) brings up uncomfortable truths for ACC Burns. As a sub-plot it shows the prevalence of drugs, sleaze and police corruption. It also intersects with the central storyline, at least enough to reveal more of Gibson’s character. 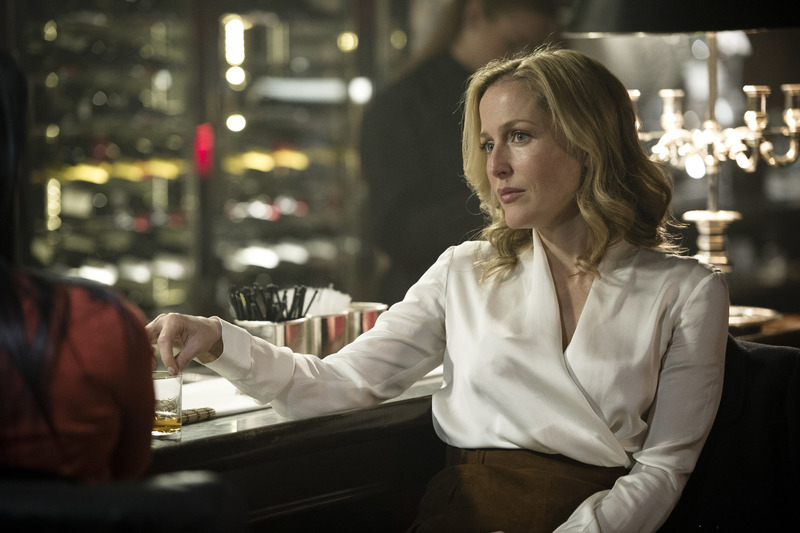 Gibson takes time to have a girly chat with her ‘right hand man’ Dani Ferrington (Niamh McGrady), and to have what looks like a glass of scotch with the pathologist, Professor Tanya Reed Smith (Archie Panjabi). Especially love the introduction to the modern dictionary of a ‘sweet night’. It is clear that Gibson champions the issue of female empowerment, which seems fair given the circumstances. It is after all, about balance and duality. In the meantime, Spector’s previously meticulous attention to the detail of the kill starts to unravel. When his boss, Charles Chandler (Patrick O’Kane) confronts him about his unauthorized home visit to a patient, Liz Tyler (Séainín Brennan) he attempts to cover his tracks and provide a plausible excuse for the break with protocol. This leads to an uncharacteristically sloppy outburst, including childish mimicry. It snowballs throughout the episode culminating in a series of fatal errors. Although this episode feels a slower pace than the previous episodes, the pace really quickens, like my heart rate, in the last 10 minutes. This, I’m watching from behind a cushion. Not to give away any spoilers but there’s a sash window, an unwise decision not to check for the bogey man before rushing in and going to the loo, building scaffolding (aka ‘burglar’s ladder’), a ‘messy’ encounter and witnesses. People really shouldn’t run with scissors. On the final cut, I yell “No!” Surely, they cut it too short. Where’s the rest of it? What’s going to happen to Burns and his colleagues now that the murder investigation will reveal the magnitude of police corruption? When are Gibson and Spector going to physically cross paths? He can’t seriously get away with it, can he?! There’s only one episode left and I really hope the last episode won’t be one of those evil cliffhangers now that there’s a second series in the pipeline. Sick and slick is what it is.